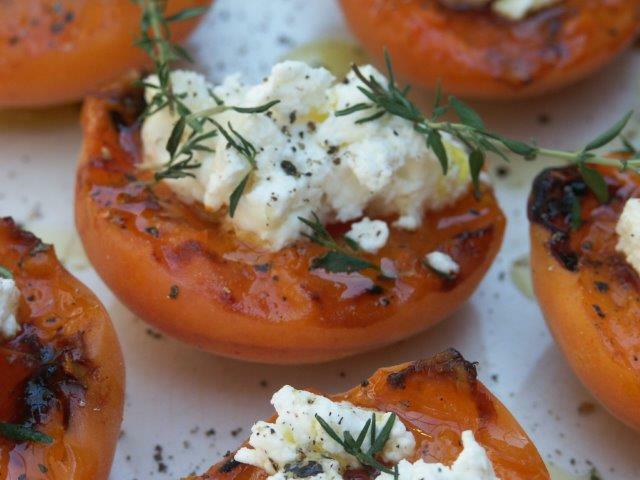 With the apricot season under way, I thought I would give you a little virtual taste of a few ways these wonderful fruits can be enjoyed. 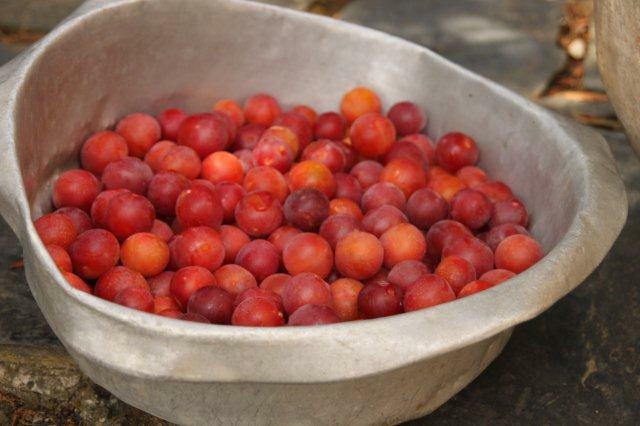 This year I was lucky enough to have the pick of the crop from a tree belonging to friends – they were away while their tree was full of ripe fruit!! 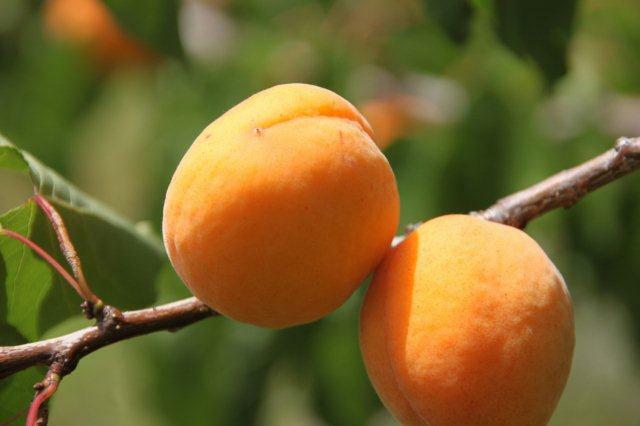 When I started to think about what to do with this bounty, the first thing which came to mind was apricot jam – beautifully orange coloured, and full of the flavours of the sun!! Whenever I make jam these days, I try to use the kind of jam sugar where you can use 500g of sugar for 1kg of fruit, which makes for a much fruitier jam. 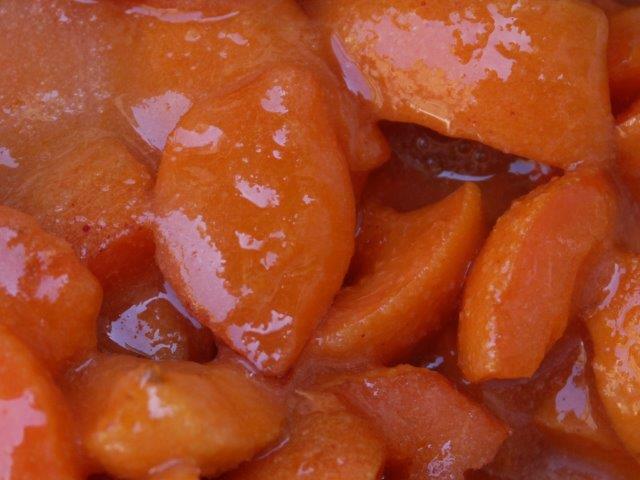 For this apricot jam I cut the apricots in half to remove the stones, and then cut each half again into four pieces. 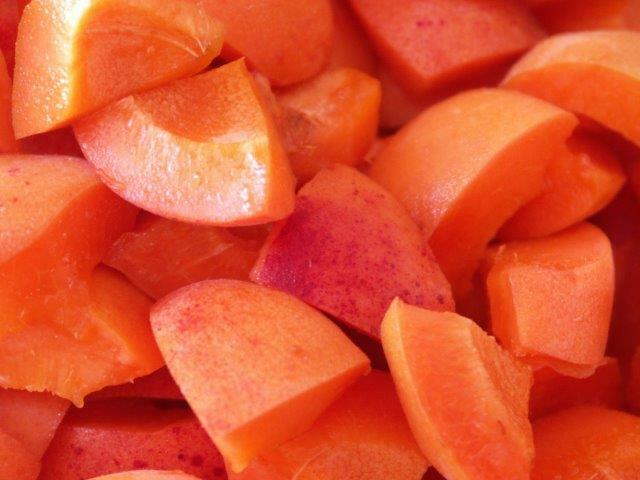 Once all the apricots were cut, I mixed them with the sugar, and put them in the refrigerator to stand overnight. 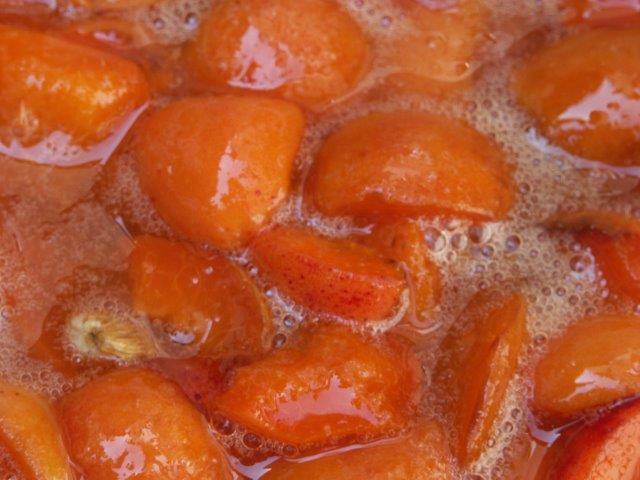 Whilst the apricots are standing, the sugar draws out the juice, and the fruit tends to hold its shape better during cooking, rather than simply turning into mush. This time I also cracked some of the apricot stones open, and added the ‘almonds’ to the mixture, hoping they would impart some of their lovely almond flavour to the jam. 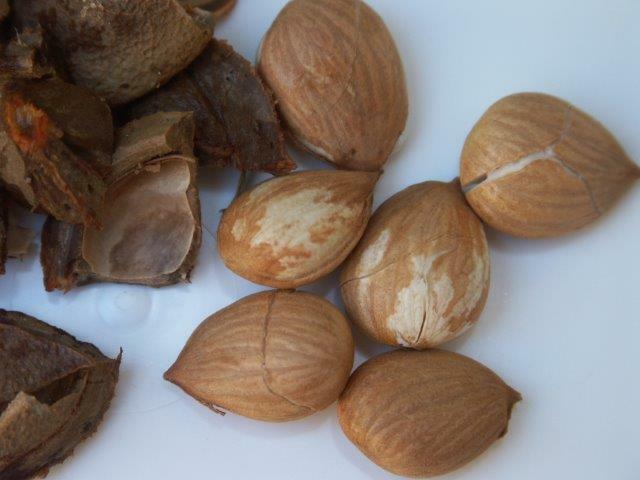 Apricot ‘almonds’ do concern small amounts of cyanide, so if you are at all concerned about this, please leave them out. The sugar had done its work, drawing out lots of juice from the apricots. Boiling time is only four minutes, so that the vitamins won’t get boiled to death altogether! The sugar which I use contains the right amount of pectin, so that the jam will always set. 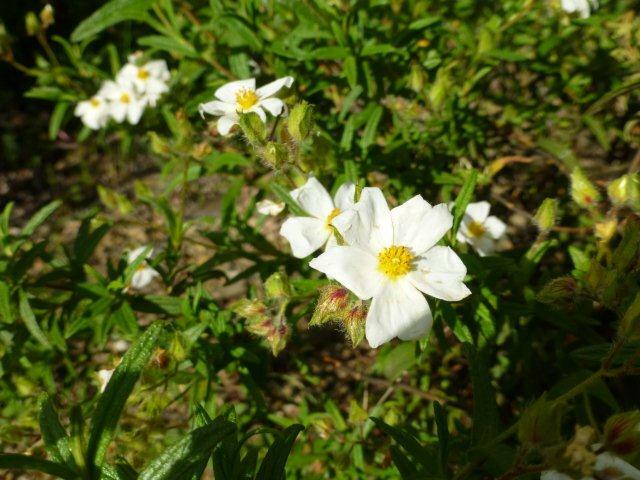 In France it is available under the name of Fruttina Extra, and you’ll be able to find the international websites for the company here. I still had a fair amount of apricots left, so I started to wonder what else I could prepare with them. 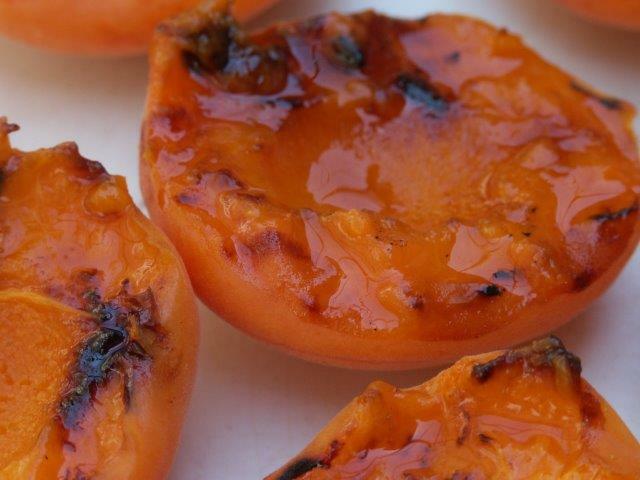 Some time ago a friend told me about grilled peaches, so I thought I would try that with the apricots. 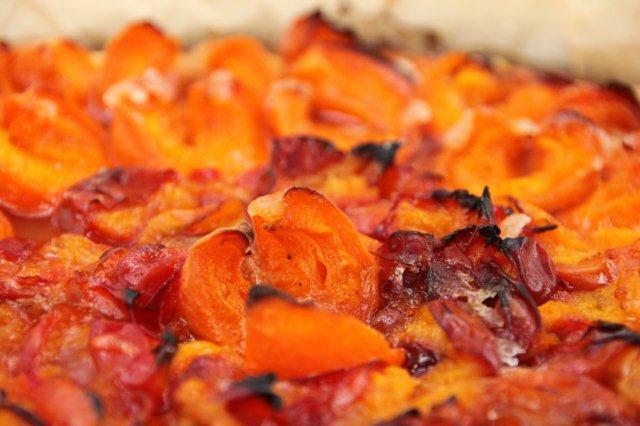 For this recipe I chose the firmest apricots I had, as they could otherwise turn to mush very quickly. I pressed my trusted cast-iron griddle pan into action, and grilled the apricots on the pre-heated griddle, cut side down, for about 5 minutes. 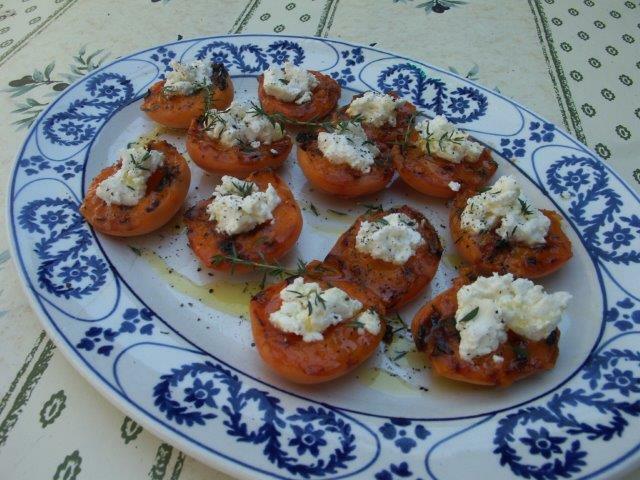 I topped each apricot with some fresh goat’s cheese, and sprinkled them with freshly ground black pepper and fresh thyme leaves. A final drizzle of olive oil, and I had a plate full of the most delicious appetizers. They were every bit as good as they look, and really quick and easy to prepare!! 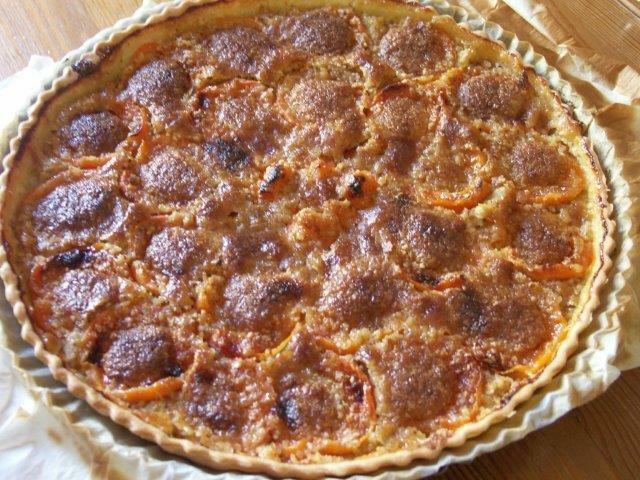 Another recipe I came across during my search was Mary Berry’s apricot frangipane tart. I followed the recipe pretty much to the letter, except for using fresh apricots where the recipe indicated tinned. And I’ll admit it right now: I used ready rolled pastry – time was short, as was the pastry!! I also ground my own almonds, which accounts for the darker colour of the frangipane. 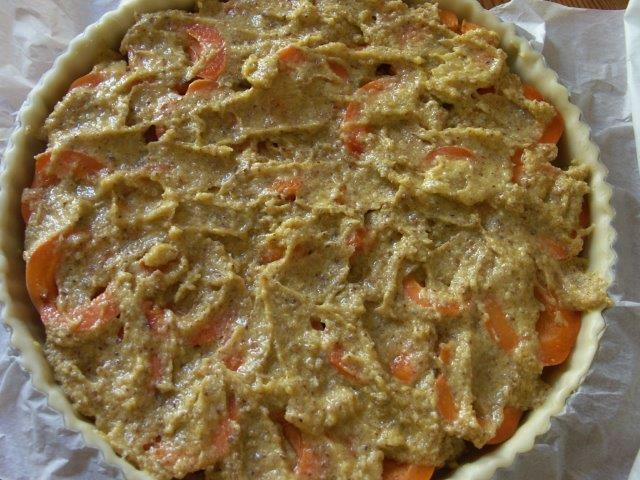 The recipe is very straightforward and quick to make, especially if you use ready rolled pastry. 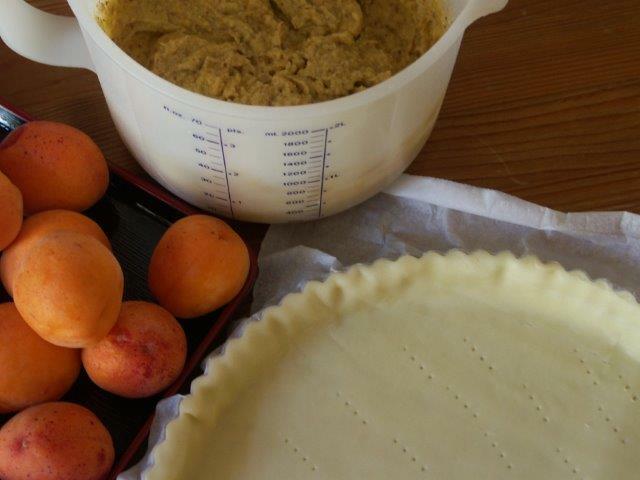 I was getting a little worried when I started to spread the frangipane mixture over the apricots – there seemed to be far too little! 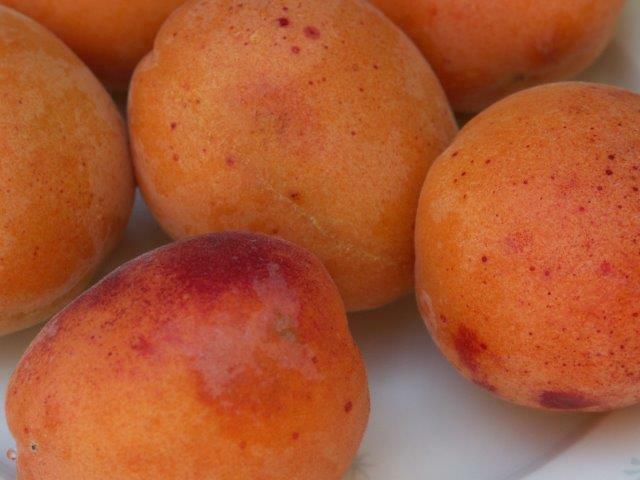 There are many more delicious recipes out there, which use apricots – what is your favourite?? Do you know what a nightingale sounds like? I didn’t until I moved to St Chinian, and even then it took me a while to figure it out. The nightingales are truly wonderful to listen to, and there are a good many secluded walks, where you can just sit and listen to them and they sing their hearts out. The quality in the videos is unfortunately not as good as I would have liked it to be, I had to take out my old camera for the evening… On the way to my favourite nightingale spot, I passed this flowering lime (linden) tree. 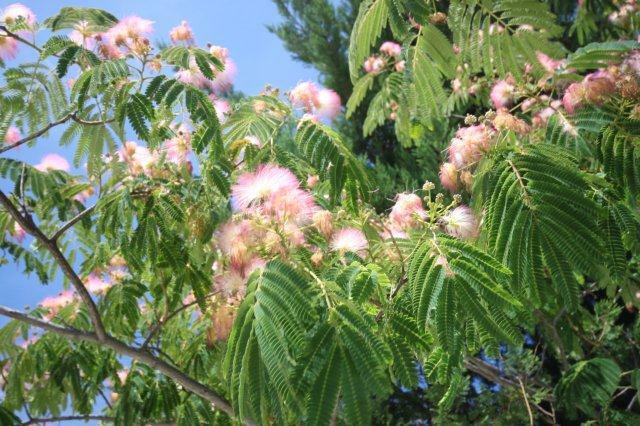 The whole tree was abuzz with honeybees and the scent of the flowers was intoxicating – simply divine! 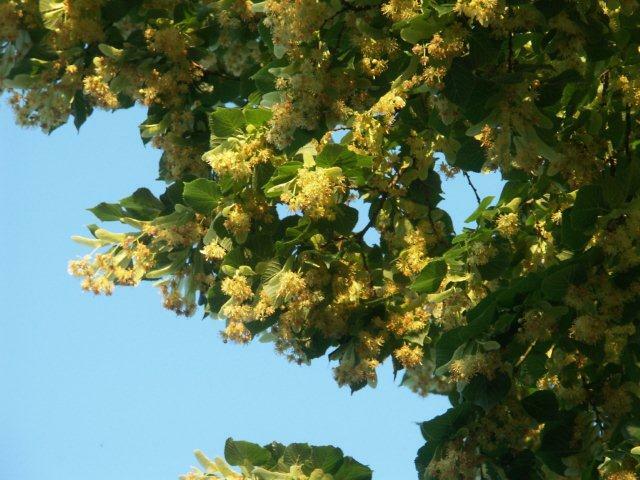 Each year it takes me a couple of days before I realise that the heavenly scent means that the lime trees are in flower! definitely an acquired taste, but so long as they are out in the wilds and not below your bedroom window they are fun to listen to. 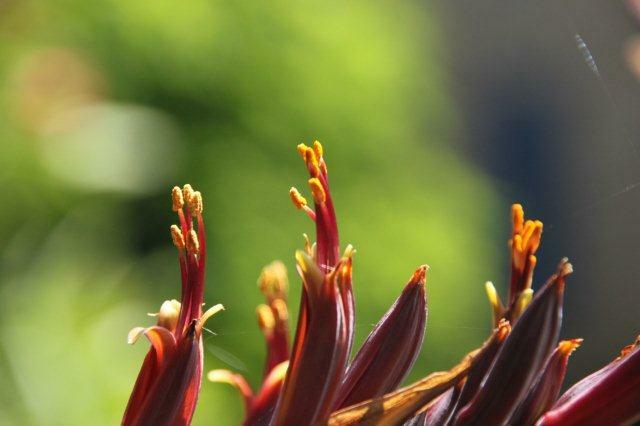 There’s been so much going on in the garden, and so this post is just a collection of random pictures, and it has no real story to it. 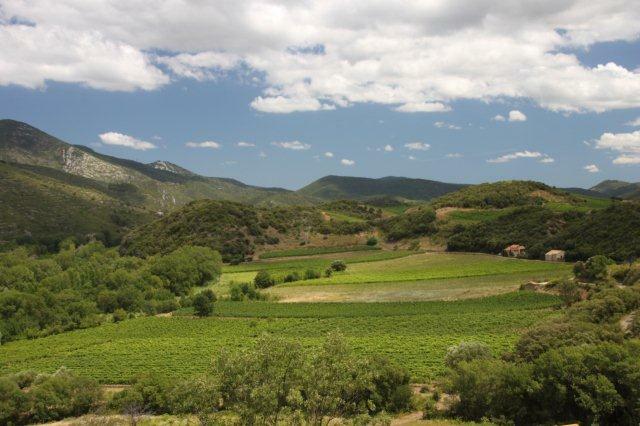 This panorama was taken on a recent cherry picking trip near Les Rossignols, just outside Roquebrun. Isn’t it amazing? 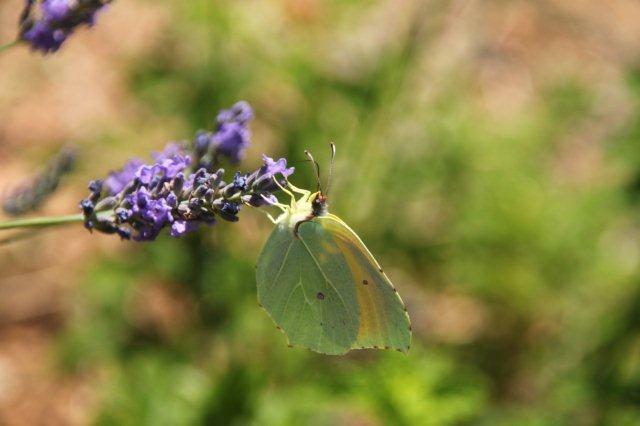 I found the most interesting critters in my garden this year. 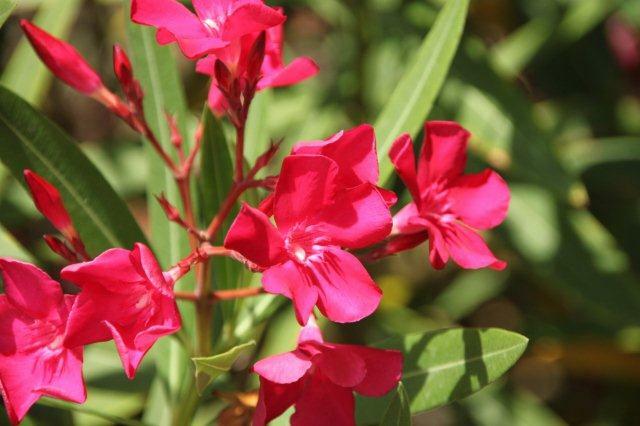 This is a moth called Proserpinus Proserpina or Willowherb Hawkmoth. I was clearing up some stuff and first of all I thought it was a dead leaf. Luckily I didn’t brush it off, and I did manage to get some decent pictures. 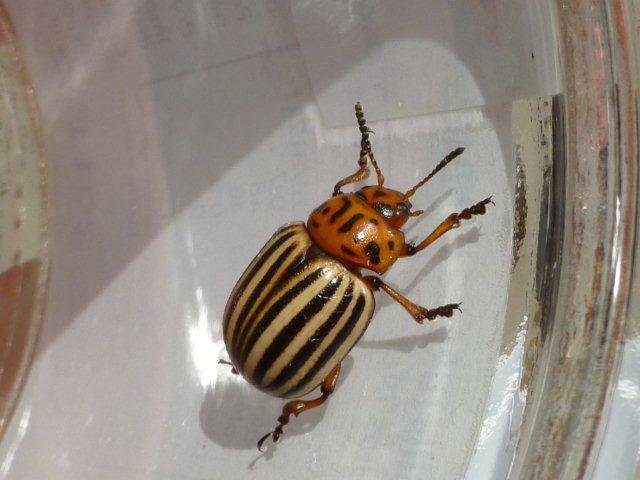 I like the way it seems to hide its head under its forelegs. And here’s another moth, this one is Epicallia Villica or Cream Spot Tiger. Wonderful name and a wonderful looking creature. I’ve not found caterpillars of either moth in my garden, so have to assume that they hatched elsewhere and just came in for a visit. 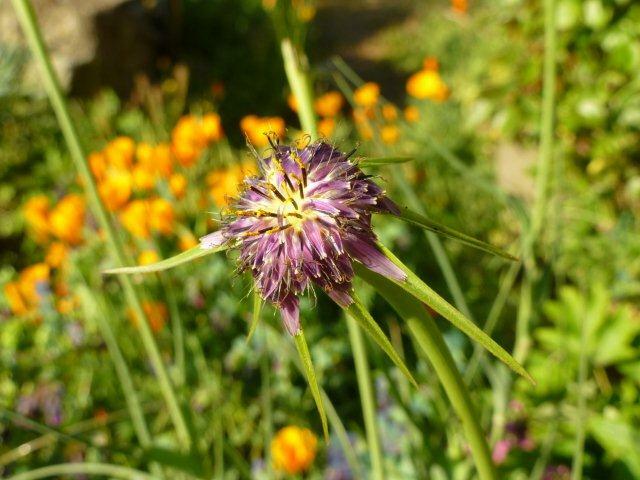 This flower, I have been reliably informed, is Tragopogon Porrifolius or wild salsify – I’ve just been looking up the wikipedia entry and it sounds as though the whole plant is edible, though I guess for some of it it’s too late. I will try and see if I can get at the root though. 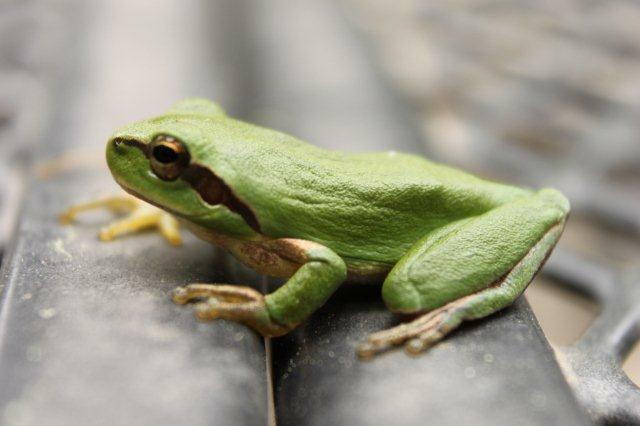 The gorgeous frog was probably still a little dazed from hibernation as he let me come really close. 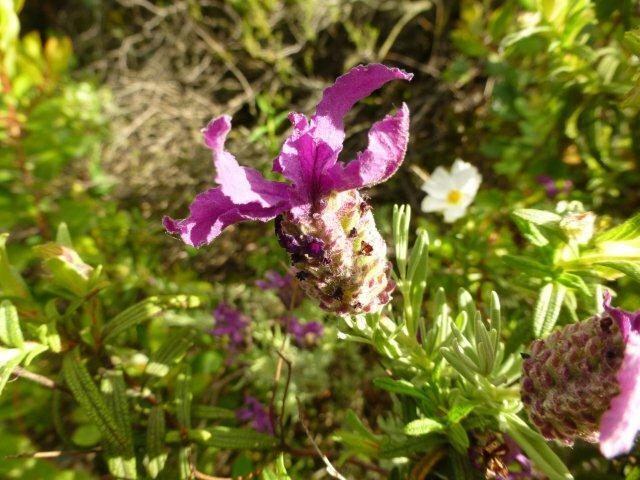 Now I don’t know what the flower in the top picture is, but the one in the bottom picture is Lavandula Stoechas, which is native to the Mediterranean region and found all over the garrigue. 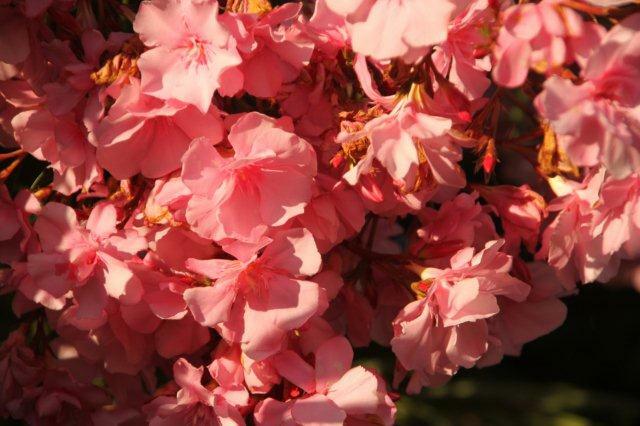 ‘Tis the time of year when the cicadas start singing – one of the signs that summer really has arrived! In places the noise can be deafening as the beasties compete with one another, but mostly it provides a very pleasant background noise, a sign that you have arrived in the South. I taped this little bit of silence at Les Rossignols near Roquebrun this afternoon. 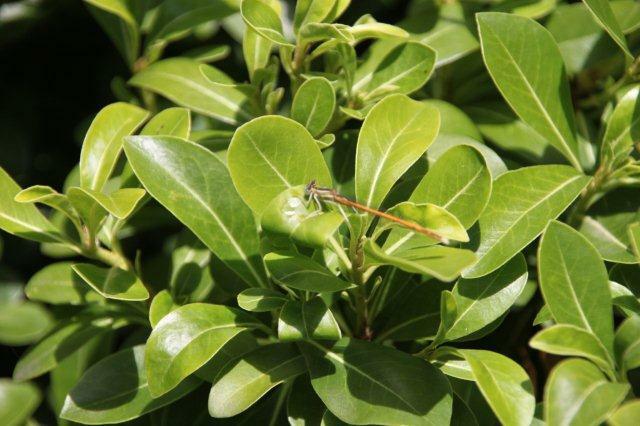 There is no car noise and at the height of the day only the cicadas are active – sheer bliss and of course it’s not easy to find such a quiet spot in our ever so noisy environment. The owner of Les Rossignols had prepared a simple and informal, but very delicious lunch. 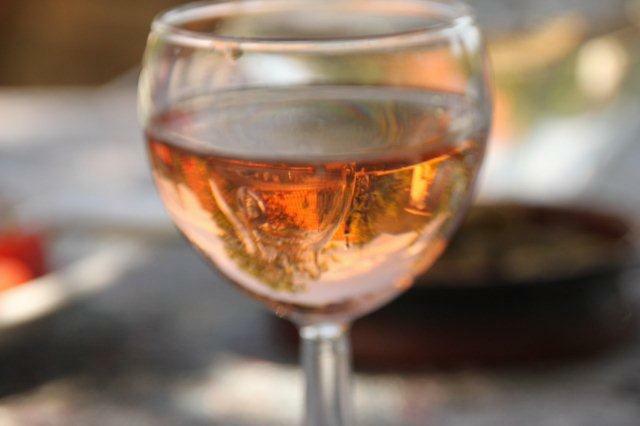 Sitting on a terrace, admiring the view of the Orb river valley, with a glass of Rose wine from Domaine de Marquise des Mures, we started with a salad of fresh garden tomatoes, a separate dish of beetroot (both home-grown), dressed with lemon juice and olive oil and some marinated olives. Main course was pasta with a sun-dried tomato sauce. 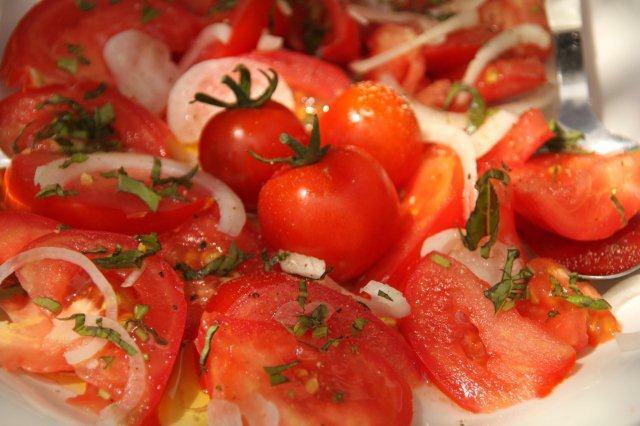 The sun-dried tomatoes (not the type in oil) are soaked to soften them a little, and then blended to a paste with chopped onions and garlic, which have been softened in some olive oil, roasted pine nuts and grated parmesan cheese. 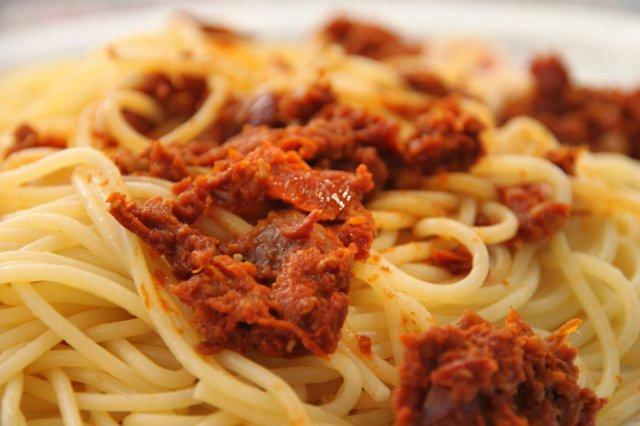 Warm before tossing with the hot pasta – yummy! For dessert we had that wonderful home-made tart made with fresh wild plums and apricots – the pastry crust was very thin and crunchy so a second piece was no hardship! At Les Rossignols I also picked up a bowl full of wild plums, which make wonderful jam and delicious tarts combined with apricots! 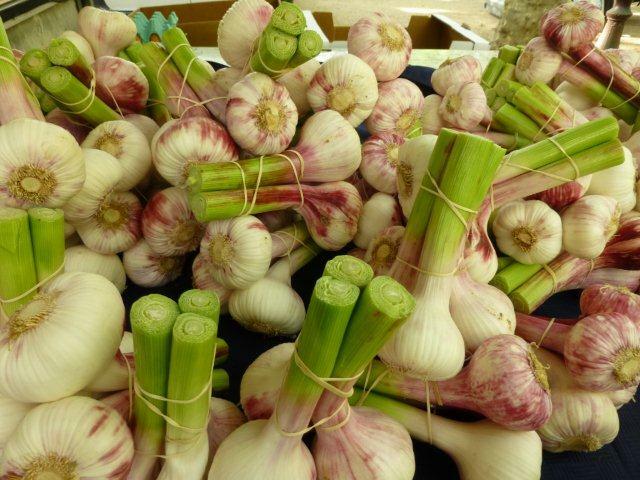 I’ll be busy this evening preserving that bounty. 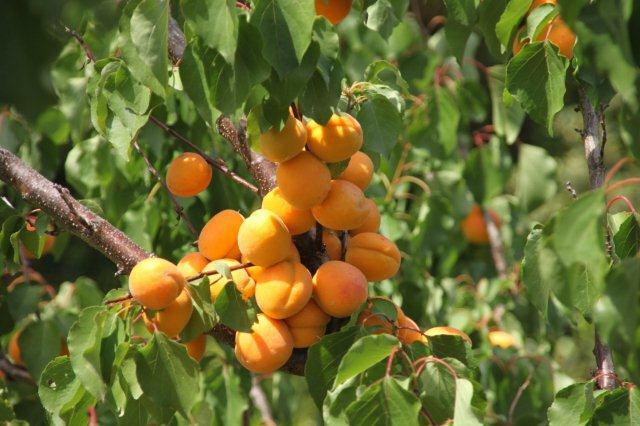 The apricot tree along the road was heavy with fruit and I wanted to show you just how abundant the crop on some trees can be. Of course just because it grows close to the road doesn’t mean that the tree does not belong to someone, so scrumping is out of the question! 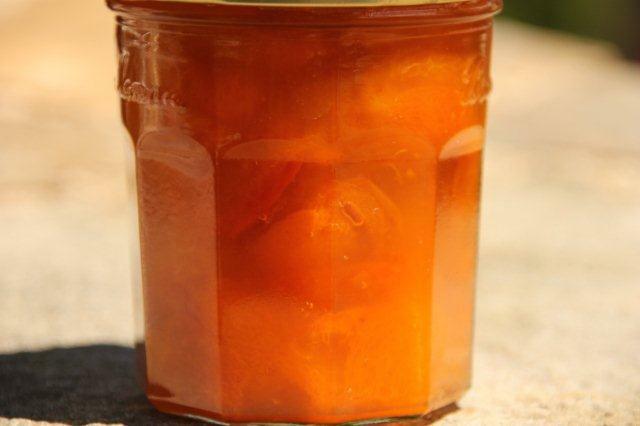 I already made some apricot jam last weekend with fruit from Barbara Cathala – last Sunday she had some very nice small apricots which were perfect and made for a very tasty result. Also earlier in the week I went for a visit to Narbonne to catch up with a friend. Le 26 is the restaurant we tried that day, not too far from the market halls. Great value lunch time menu and very good food. 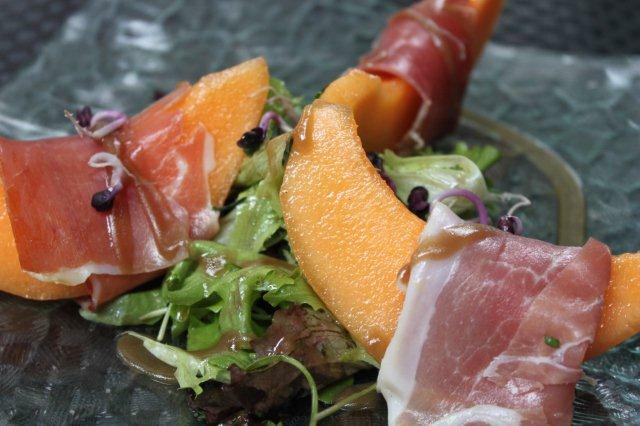 There was melon with ham for starter – almost a bit of a cliche, but when the melon is perfectly ripe and ham tender and tasty, it’s sublime. 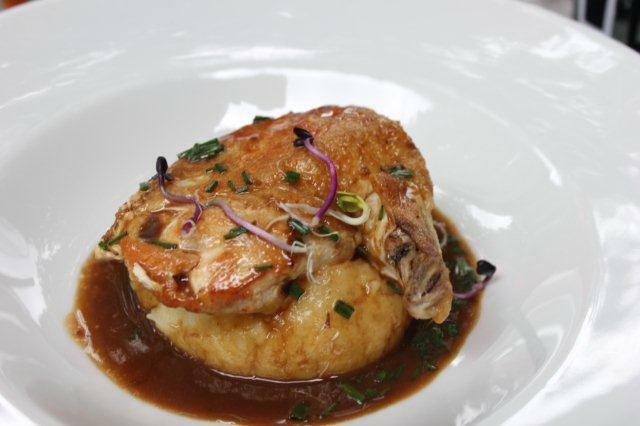 For main course there was supreme de poulet, beautifully cooked on a bed of mashed potatoes, and served with an oyster mushroom sauce. 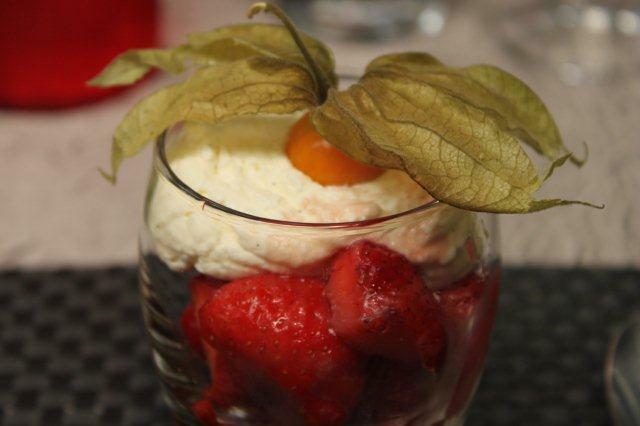 Dessert was glass full of strawberries with creme chantilly, not your ordinary whipped cream, but the real thing with vanilla and a little sugar….! 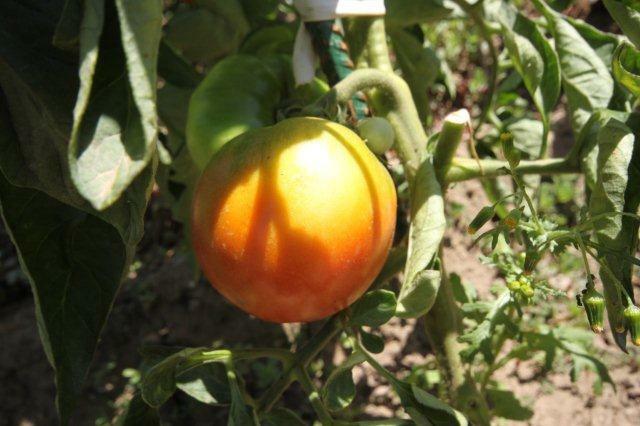 In my garden exciting stuff is happening – the first of the tomato crop is ripening!! 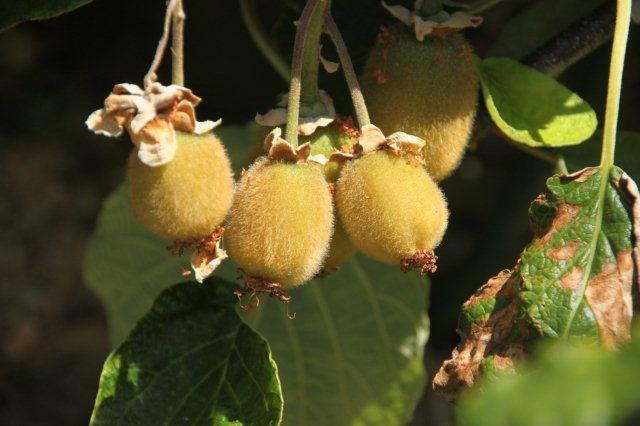 It started to turn pale orange and should be ready for picking (and eating) any day now! 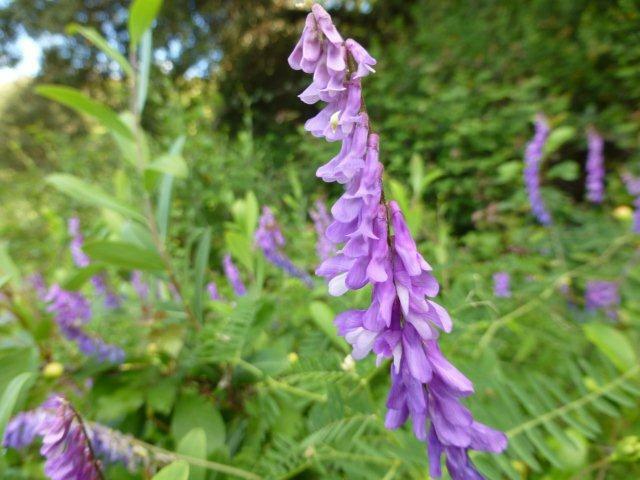 We’ve had some rain this week (unusual for this time of year, but very welcome!) and things are growing apace. 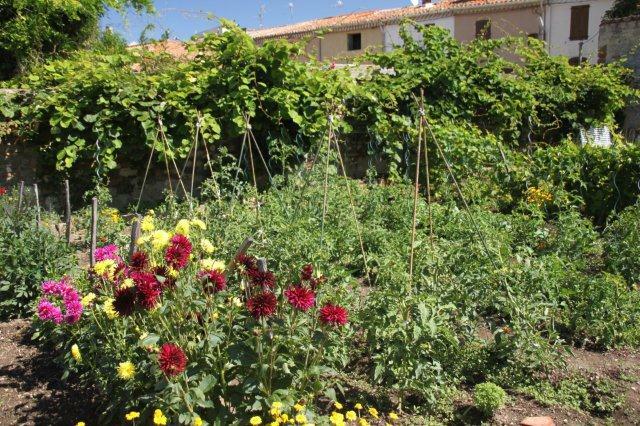 Unfortunately not just the vegetables and flowers but also the weeds, but such is gardening life. 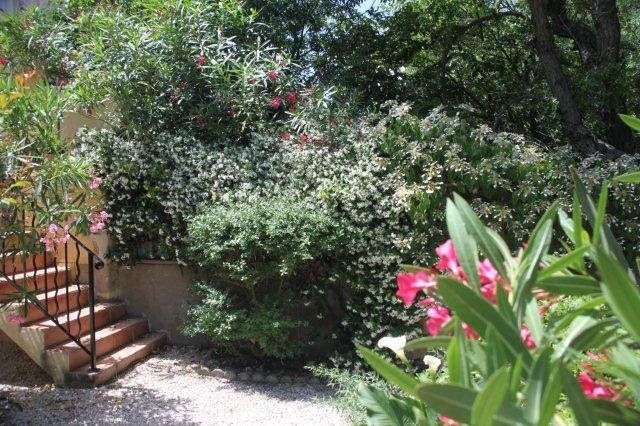 The garden at La Digue in St Chinian was looking particularly lovely last week, with the climbing hydrangea and the trachelospermum flowering at the same time as the phormium and the oleander.